Manufacturer of engraved cylinders, backer products etc. Engraved Cylinders are widely used in Gravure Printing as means of transferring ink to the substrate. 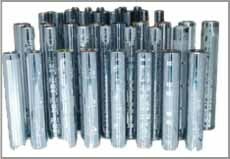 These consist of electronically engraved cylinders which have designs etched on them that are to be printed on the desired surface highly precise engraved cylinders thus developed. Proper maintenance of these cylinders is essential of obtaining the desired results. We manufacture the Cylinder in various sizes as per the customer's / Converter's requirements as well as for our in house consumption. The plant has the capacity to roll out 1000 cylinders per month. We have our own team for the development of design for the customers.